Inventive, one-of-a-kind custom glass design comes from the fusion of engineering and art. Sei studio applies complex techniques and professional engineering to coax an unruly organic material into precise and safely designed structures. From initial sketch to final installation, we are intimately involved in every phase of the process. We are committed to the hand of the artist, preserving and pushing the medium in uncharted directions. Extensive research and prototyping allows us to expand the possibilities of glass. If our clients can imagine it, we can bring it to life. Suzan Etkin's passionate involvement with glass began in 1993, when she was invited to design sculptural chandeliers for gallery exhibitions with Giorgio Giuman and master glass blowers in Murano, Italy. Prior to working with glass as a medium she was the production manager for ‘Andy Warhol’s TV’ for eight years, and quickly emerged as a conceptual artist of global recognition. Her work has been shown in the Museum of Modern Art in New York, Paul Kasmin Gallery, Holly Solomon Gallery, and other museums and galleries around the world. 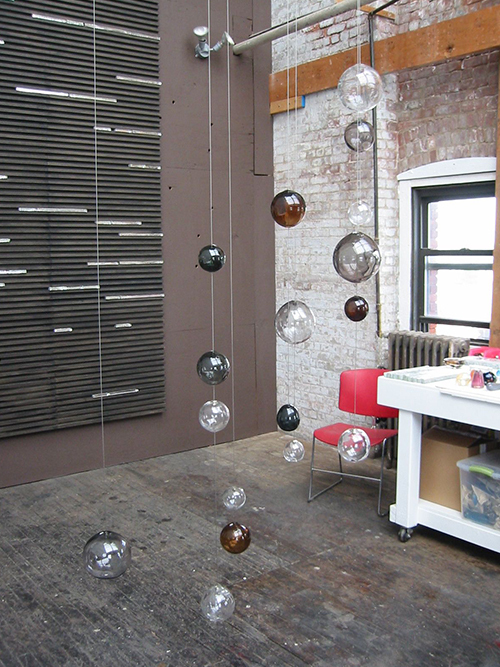 In 2001, Suzan founded sei studio in SoHo with her husband, Brenden FitzGerald. They have collaborated with some of the industry’s most innovative architects and interior designers to produce custom chandeliers and art features for hundreds of landmark spaces, including the W Hotel Seoul, Mandarin Oriental New York, and Intercontinental Hong Kong.